You can protect your health while reducing utility bills. We can help you to protect your brain and body by minimizing your exposure to microbes, chemicals, particles, and radiation. The American Lung Association reported that air pollution in typical homes in the USA is between two and ten times worse than outside. Researchers at the Massachusetts School of Public Health estimate that outdoor air pollution is responsible for about 200,000 premature deaths in the United States annually. The EPA estimates that the average existing home is about 30% less energy efficient than a new home built to minimum code requirements. Our infrared camera and other special diagnostic equipment will enable you to see where air and water vapor leak in and out of your home. 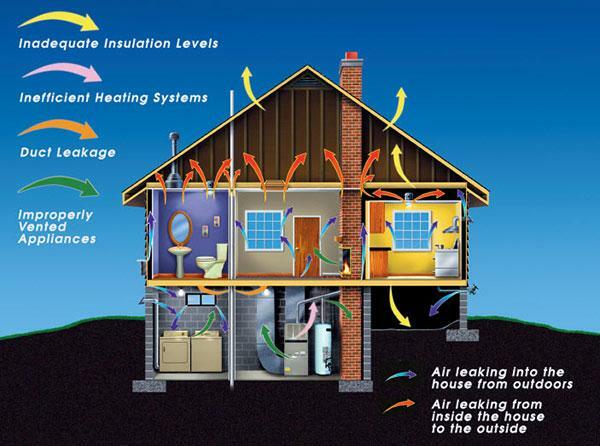 You will receive a variety of free sample materials to seal unwanted air leaks without adversely affecting the beauty of your home. Until the testing and consulting is completed, you are unlikely to know what the results will be worth to you, so here is how we make certain that whatever you decide to pay us will be fair to you: Upon completion of our professional testing and consulting services, you get to decide whither our services have been worth the list price, or something less. Your Satisfaction is Unconditionally Guaranteed. Contact me to discuss your concerns. Property resale value is typically increased between $1,000-to-$2,500 of each $100 reduction in annual utility bills. Entry of allergenic, irritating, toxic and radioactive particles from outdoors is reduced. Allergens, irritants, and chemicals from indoor sources are consistently diluted and flushed-out. The frequency and severity of allergy and asthma symptoms are typically reduced. Exposure to radioactive radon and its progeny, including lead, is reduced. Cognitive abilities and productivity are typically increased. Quality of sleep is typically increased. Frequency and severity of illnesses are typically decreased. May enable you to avoid major health problems, including cancer, dementia, strokes, COPD, etc. that could be developing for many years before symptoms appear. May slow the rate at which your brain and body age physically. Use instruments to monitor and record indoor temperature, humidity, carbon monoxide, chemicals and particles. For an example of available instruments see www.getawair.com. Use a mechanical fresh air supply system to provide the highly filtered air you want while diluting and flushing-out allergens, irritants, and chemicals from indoor sources. Use kitchen and bathroom exhausts to remove odors and excessive humidity. In cold climates, like Nebraska’s, make the building envelope tight from the inside to help prevent condensation of moisture inside of cold walls during the winter. Use a deep-pleated furnace air filter that is highly effective but does not restrict airflow enough to reduce the energy efficiency of your heating and cooling systems. Insulate the building envelope as recommended by your State’s Energy Office. A nationwide study reported that homes built, or upgraded, to meet Energy Star standards have purer air and have lower utility bills. A home with low utility bills is worth more. For example: If a home buyer obtains a 30-year mortgage at 6% interest, then for each $100 reduction in annual utility bills, the buyer can pay $1,376 more for the house without increasing the monthly total of mortgage plus utility payments. An energy efficient home has lower levels of airborne dust, odors, and chemicals when fresh filtered air is provided at an optimal rate. Toxic and radioactive particles enter the body and brain via the lungs and olfactory bulb. Does ionizing radiation influence Alzheimer’s disease risk?